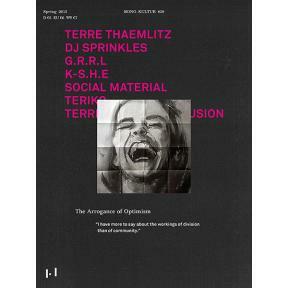 Politics and the dance floor make for uneasy bedfellows, and it is this uneasiness that drives most of the work of Terre Thaemlitz, confronting head-on issues that are usually off limits in electronic music. Thaemlitz is a producer and DJ, also known under his monikers of DJ Sprinkles, Social Material, and K-S.H.E, among others. But she is also a writer, educator and activist of sorts, with very fluid notions of gender, switching continuously between male and female drag. Born in 1968, Terre Thaemlitz left the rigidly conservative and violently homophobic environment of his home state, Missouri, in the mid-1980s for New York. She became involved in the queer and transgender scenes both socially and musically at a time when house music was not a genre but simply the wide open sound of a specific social and political space. As New York’s underground queer music scenes dissolved under gentrification, Thaemlitz eventually relocated to Tokyo at the beginning of the ’00s. Today, Terre Thaemlitz is a reference point not only within the confines of electronic music, but particularly for transgendered communities. The fragility of identity – sexual and otherwise – in relation to the larger world is a central theme for Thaemlitz, tirelessly dissecting the boundaries and friction between public and private, between minority and mainstream with a brutal sharpness and criticality that are often somewhat irritating, continuously questioning and exposing political and social systems and the violence they generate. In a challenging interview with mono.kultur, Terre Thaemlitz talked about the politics of sexuality, his disillusion with the music industry, and why roller disco was so amazing. Visually, the issue is a dark affair, steeped in a dirty, gritty black. Printed on no less than six different paper stocks and juxtaposing several grids and graphic systems, it creates its own visual logic – only to disturb our most fundamental habits of reading and navigating a magazine by opening backwards, from right to left.